« Are We From Different Planets? Company workplaces are similar to family households. Both require the people in them to communicate well, cooperate on tasks and have consideration for each other. Whether the group is made up of managers and employees or parents and kids, the commonality both groups share is that someone is responsible for leading the way. It is easy to see when companies and families are achieving their goals. Evident markers include positive interaction, ease in collaboration and only the occasional misunderstanding. Together, they achieve success as individuals and work well as a team. Overall, there is a high level of enjoyment, respect for others and good productivity. But, when either of these groups are having problems, common indicators are lack of communication, relationship tensions, confusion and chaos. Children will often rebel against or ignore misguided parental leadership just as resistance and push-back are common behaviours from employees who are poorly managed. Parents might blame the problems on “difficult children” rather than admit a lack of consistency in parenting. In the workplace, managers describe “challenging employees” because they don’t readily recognize poor or inconsistent supervisory skills in themselves. The reality is that in all situations, the person in the leading role is responsible. While problems can start out small and infrequent, they can quickly build and snowball into larger and regular issues. Managers who avoid or postpone addressing problems as they arise, risk putting the entire company into crisis. Everybody and every company has a tipping point. 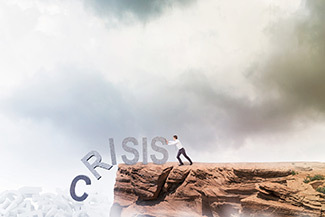 It is the critical time when the “usual” problems blow up into crisis. When that happens, people are no longer able to tolerate or accept problems, issues and stress. They will either fight back or walk away. At Pam Paquet & Associates we often witness the aftermath of the tipping point when we are called in to help manage the crisis that ensues. Since we have done this so often, we are able to identify a common component—an ineffective manager. Yes, managers and team leaders continue to be the key influencers and instigators that cause employees to reach their tipping points. Conversely, managers who are aware of the signals of a looming crisis are in the best position to prevent one. When managers continually mismanage people, they create stress. Employees feel the tension with every communication and interaction. Staff aren’t compelled or in a position to fix the problem so they suffer silently, let the tension build and eventually lose their cool. Angry outbursts like punching a computer or snapping a pencil in half are not signs of poor coping skills, they are people’s tipping points being expressed. When managers miss the mark, employees pay the price. It is a natural consequence that stress effects employees’ physical and mental health. Ongoing problems that are never addressed, no matter how small, are like a constant drip of water from a tap and an annoying distraction to an employee. When sick days increase, don’t appear justified or go unexplained, then chances are this is the only way people feel they can get a break from a bad boss. Employees who don’t feel they are being heard by their manager will eventually give up and go silent. When this happens, they will start gossiping with others. Soon, a war-like mentality develops. Plotting against a bad manager and rallying allies with other colleagues becomes a strategic move to feel safe in the workplace. When employees resort to message relaying that begins with, “You tell him . . .” then it is just a matter of time before the tipping point hits and people will either continue to battle or leave. If it weren’t for the paycheque . . .
Managers, good or bad, receive immediate and obvious feedback from their employees. If managers ignore or disregard these cues they will struggle to figure out how to get good results and compliant employees. If things aren’t going well, managers might resort to using their power or status to improve employee responsiveness. When managers don’t have good leadership skills, ignore feedback or are just plain resistant to admit fault, intimidation tactics to force others to follow obediently is common. If the power piece is evident, then the tipping point isn’t far behind. Unfortunately, we have way too much experience with companies in crisis because they did not pay attention to these signs and under estimated the power and effect of heedless managers. It is so difficult to turn people and workplaces around once the full impact of failed management has had the opportunity to snow ball and surpass the tipping point. This article is not about fixing these signs. It is about identifying them so managers acknowledge them and commit to turning the needle of the impending tipping point back so crisis is averted, these signs reduced and communication restored. At Pam Paquet and Associates, we can recognize tipping point signs that are specific to particular work groups. Before the crisis hits, let our experience of working with companies who have had full-blown disasters, bring this important awareness to your staff leaders. Contact us at pam@thepossibilities.ca or 604-349-8660 to explore solutions for your managers and teams. This entry was posted by Pam Paquet and is filed under Business Assertiveness, Employee Training, Leadership. You can follow any responses to this entry through the RSS 2.0 feed. Both comments and pings are currently closed.